Reviews of single products based on quality, performance, and application. Believe it or not, at Arc-Zone we do get calls every year from folks who are not welders, but have welders in their life that they want to get a gift for. So over the years we’ve come up with lists of items that make great gifts, our favorite welding things. But really, this is a post about welding accessories–there is still time to get the welder in your life something special, or share this post with someone who wants to know what to get YOU. Of course the easiest, and quickest gift is the Arc-Zone.com gift card, good for any welding accessory in our store. And, we’ll deliver it via email! 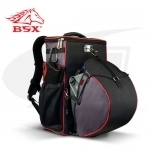 If you don’t delay and have time for shipping, one of my favorite items in our store is the BSX HelmetCatch(TM) backpack… it’s rugged enough for welding in the field, and it’s stylish. The special compartment protects your welding helmet, and the rest of the bag, and the fact that it is a backpack allows you to easily carry all your welding tools to your shop or jobsite. You’ll find some more great welding gift ideas over on the JoeWelder.com blog: or browse the Arc-Zone.com site (pay special attention to the Welding Apparel for women). This entry was posted in Welding Product Reviews, Welding Tips, Working Women & Society on December 18, 2013 by Carmen. Just the other day I ran across a video from the 2012 Fabtech show, introducing the New! Innovative! E3 Tungsten! Which, of course, got me to wondering what’s new about this tungsten… so I watched the video, which you can too at the E3 website, and I came to the conclusion: not much. Adding three oxides to tungsten to replace Thoriated tungsten is not really a new idea. 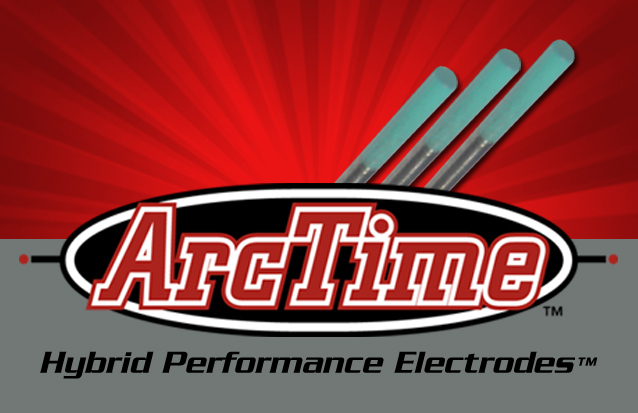 Weldcraft has a Rare Earth blend, TriMix has been around for years, and Arc-Zone has been selling ArcTime Hybrid Performance tungsten electrodes –for all power sources, and all metals, for several years! All these tungsten electrodes are excellent replacements for Thoriated tungsten, and even perform better. In addition there are other blends such as Lanthanated and Ceriated tungsten that are also good for many welding applications. And, of course, Arc-Zone stocks those as well. 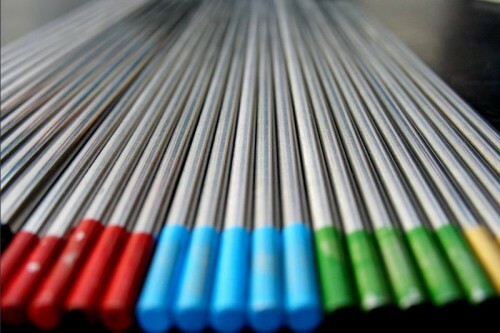 In fact, I think we have the most comprehensive line of the very best tungsten electrodes for TIG and Plasma Arc Welding in the industry! In fact, the idea of adding three oxides to tungsten is not that new. Weldcraft offers the Rare Earth blend, Tri-Mix has been around for years, and Arc-Zone has been selling ArcTime(TM) a hybrid blend of tungsten for nearly 10 years! Our Quality Control staff checks each package of ArcTime to ensure that each tungsten electrode passes our 5-point inspection. We’ve seen problems from inconsistent finish, flaking paint, and even bent electrodes. In fact, over on JoeWelder.com Jim wrote an article about “what’s the difference” between manufacturers. So that’s the latest buzz on tungsten electrodes… if you ever have any questions about your welding application and the best tungsten to use, give our customer care folks a call: 800-944-2243 (toll free US) or 760-931-1500 (worldwide). As Jim would say, they’ll “dial you in,” and get you the best solution for your welding needs. This entry was posted in TIG /GTAW Welding, Welding Product Reviews on March 4, 2013 by Carmen. Then Oprah Winfrey jumped on the bandwagon (ok, yes, it was years later) with her favorite things. And now Carmen Electrode wants to share her favorite (welding) things with you. These would be great gifts for that special welder in your life… or good to put on your list of favorite things in case anyone wants to buy you a gift that supports you in your welding life. 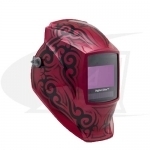 One of my favorite things these days is my Digital Elite Fury Auto Darkening Welding Helmet. It’s not the cheapest welding helmet you can find, but then again my eye protection is worth it! This welding helmet has precision digital control driven by four independent arc sensors and lithium batteries that will last for 3,000 hours! (You can check out all the technical specs over on the Arc-Zone.com website.) The other reason I like this helmet is its look. Yes, it’s pink, but it’s a strong, rich, dark pink that means business…. and the graphics are pretty hot too. Of course, if this is not for you, Arc-Zone has lots of top-of-the-line welding helmets to choose from, and this handy guide on Choosing Welding Helmets and Goggles (pdf). Another accessory I really like is the remote amperage controls for welding far from your machine. 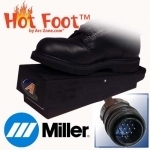 I especially like the Hot Foot™, it’s rugged and has a low profile design that is comfortable and allows for precision adjustments. So while my foot takes control of the amperage, I can better concentrate on my handwork to lay down nice beads. You can hook up these pedals to your Miller, Lincoln, or ESAB machine, no problem. Arc-Zone also carries a full line of remote amp controls, from fingertip amperage controls that attach to your TIG welding torch to on-off switches and all the connectors and adapters you’ll need to plug in and go! Now if you’re really working where there is restricted access to your weld, you’ll want to take a look at my favorite, the tiniest of TIG torches, the Micro TIG. Air-cooled or water-cooled it is a great TIG welding torch to add to your tool box. Arc-Zone not only carries the Weldcraft WP-50 and the WP-125 Micro TIG torches, we also carry the air-cooled Micro TIG from CK Worldwide as well as CK’s water-cooled Micro TIG. Have you seen the Ron Covell DVDs? Not only my favorite of the instructional DVDs, Ron and his DVDs are well known in the industry–you can advance your knowledge of TIG Welding, you can learn from master fabricator Ron Covell– we carry his DVDs along with a cool line up of books. 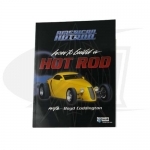 I especially like the coffee table books like American Hot Rod, Dream Garages, and of course, SO-CAL Speed Shop. These books are chock full of information AND inspiration. And last, but certainly not my least favorite: the gift card. I certainly wouldn’t mind if someone got me an Arc-Zone.com Gift Card…. from $25 and up, money to use towards a purchase at Arc-Zone! There’s still time to order your favorite welding accessories online at Arc-Zone.com and get it in time for Christmas. If you order by Friday, December 21, 2012, in-stock items can ship UPS Red. If you any questions, please call (or live chat during our office hours) our Customer Care team and they’ll help you out. And not just over the holidays! 1-800-944-2243. This entry was posted in TIG /GTAW Welding, Welding Product Reviews on December 18, 2012 by Carmen. When it comes to TIG welding, the question isn’t red or blue—thanks to the invention of the inverter power supply and companies like Miller Electric and Lincoln Electric there are some great options out there for high quality, affordable welding machines. The next question, however, is air-cooled or water-cooled TIG torch? The two most popular TIG / GTAW welding torches are the 9 Series air-cooled TIG torch and the 20 Series water-cooled TIG torch. One of the benefits of welding with an air-cooled TIG torch is that you don’t have to have a water supply nearby—in other words, out in the field. You also may not want to spend the money on a water cooler for your welder; even an economical welding water cooler like Arc-Zone’s TIG-er will run you over $500. Bottom line: if you don’t have a cooler, don’t have access to water, and/or you don’t need to run a lot long beads and worry about your torch getting too hot, then you’ll probably be fine with an air-cooled TIG welding torch. The 9 series is a good choice. 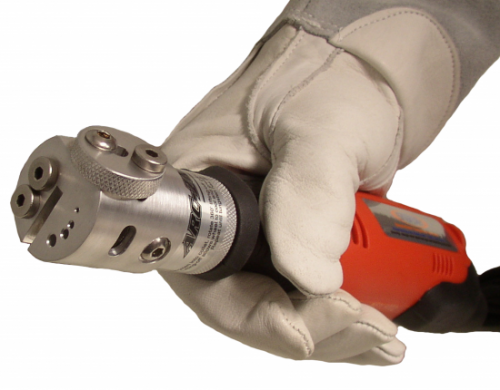 It is small yet powerful and easy to handle—perfect for a variety of TIG welding applications. If you need more power, there are other options among the available air-cooled series of TIG torches. With innovations in torch design and technology you can find a torch that goes up to 300 amps like the CS-300 Crafter Series super heavy-duty TIG torch from Weldcraft. When patience and control are important, you don’t want to be in a rush to finish your bead before your torch gets hot! So if you find yourself putting down your torch because it gets too hot, or you need more power you’ll want a water-cooled TIG torch. With the water-cooled torches of course you’ll need water. Now if you’re working in a weld shop with good reliable access to water, you may be able to hook right up to your water supply. 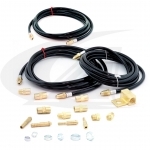 Arc-Zone has a kit that has all the parts you’ll need from water-in and –out hoses to the power cable adapter and the couplers and bib fittings. Another low-cost option, not to mention a good way to practice your TIG welding skills, is to build your own water cooler. For more information and some great tips, check out “A Tale of Two Welders” at The Fabricator magazine. If you choose that route, Arc-Zone can help you with all the fittings you’ll need to put it all together. And, if you just want to get welding—Arc-Zone has a great line-up of water coolers and replacement parts in stock and ready to ship! The popular 20 series water-cooled TIG torch will get you 250 amps of power, and it’s small and lightweight. It’s popular because of its versatility and ability to get a lot of welding jobs done. For the big hot jobs, you’ll want to check out the 500 Amp WP-12 torch from Weldcraft or the CK510 tig torch—two heavy-duty water-cooled torches that can handle just about any job. This entry was posted in TIG /GTAW Welding, Welding Product Reviews on November 5, 2012 by Carmen. Just as there are many ways to skin a cat (as a cat lover, I hate that image!) there are many ways to grind your tungsten electrode for your TIG / GTAW welding or Plasma Arc Welding application–not to mention a number of tools to help you. 1. Wyatt has a couple of hand-held tungsten electrode grinders sitting right on his work bench and yet he selects a plain ole wheel grinder and demos grinding by hand. He does it well, however…. 2. I can see how hand grinding can really affect the shape/ geometry and consistency of your tungsten electrode–and not in a good way. Sure, when you’ve been working in the industry as long as Wyatt, you have a good eye for figuring out your tungsten angle, not to mention a steady hand, but a less experienced welder or one working in an automated environment or where repeatability of the process is required, there’s nothing like a tungsten electrode grinding machine to get the job done. Plus, you’ll stop wearing grooves in your wheel grinder, you’ll improve your weld quality, you’ll reduce tungsten waste, and improve operator safety. Over on JoeWelder.com, our own master fabricator Jim Watson is putting together some pretty extensive reviews of the tungsten electrode grinders we have at Arc-Zone (we have the most complete lineup in the industry). Another popular handheld tungsten grinder is the Techsouth Powerpoint DCS which is like the Sharpie in that it is a reasonably priced, is truly handheld but this machine offers a Dust Collection System (DCS). Though a bit heavy to be truly “hand held” The CK Worldwide Turbo Sharp X tungsten electrode grinder is another great grinder with rugged motor and an enclosed grinding chamber that offers excellent dust collection. Jim tells us that CK includes a mounting bracket as a standard accessory which addresses the heft of the unit. It even has an optional “Red Head” accessory that will let this grinder handle electrodes from 5/32″ to 1/4″ and the robust motor makes that a completely viable option. We’ll keep you posted about future reviews of the tungsten electrode grinders as they come in! This entry was posted in Welding Product Reviews on September 21, 2012 by Carmen.